See here for the background. This conversation has come up before, most recently as I recall about a decade ago when one of the options was to bring the line through the Heights, along the former rail right of way that is now the White Oak bike trail. Needless to say, that’s not on the table. You can see the presentation with all of the routes that were considered this time at the link above. 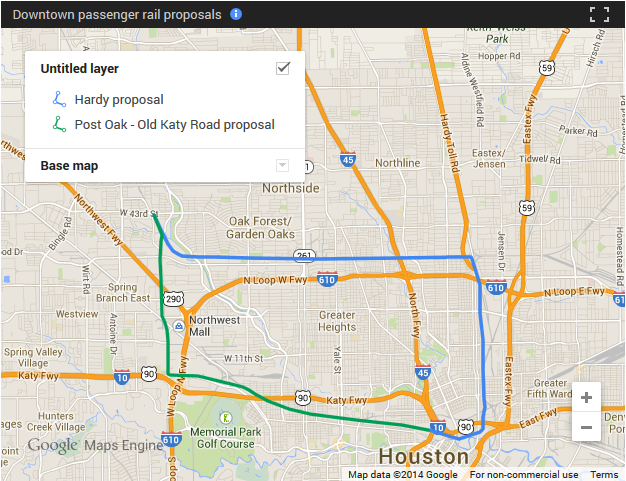 I don’t know much about the northern path that would go to the Hardy Toll Road right of way, but the Katy Road/MKT option would basically run along one possible path for the Inner Katy light rail line, if it ever gets onto a drawing board. It might make sense to build a station or two along the way for this configuration, given the population and employment locations along Washington Avenue. I just hope that if they do this, they consider doing something about the rail crossings at Durham/Shepherd, Heights, Sawyer, and Houston Avenue. Traffic gets snarled up enough with the infrequent freight train schedule; with commuter rail frequency it would be a nightmare, especially at Durham/Shepherd. I’m sure that will add another hundred million or two to the price tag, but come on. The need and the benefit are obvious.